It seems that quite a few people born into Generation-X (myself included) have a very fond spot for this classic board game called The Game of Life. I still remember playing this game as a kid and having a blast as we played this rather cool looking board game (spin wheel included) with friends and family in order to secure good jobs, get married, buy a house and engage in a variety of other "lifely" activities. 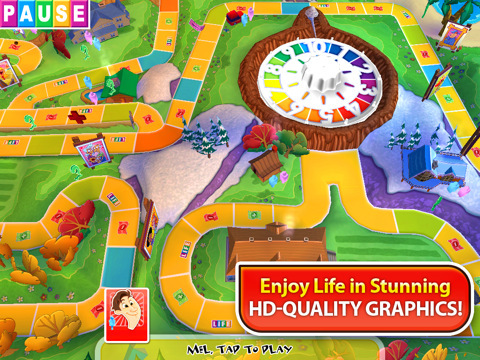 Unlike Monopoly, The Game of Life was far superior, especially with its 3D type board, a very cool spinning wheel and more colours than Disney Land... it was a good time to be a kid. Needless to say, I was a little apprehensive as to how it would translate on the iPad and iPad 2. 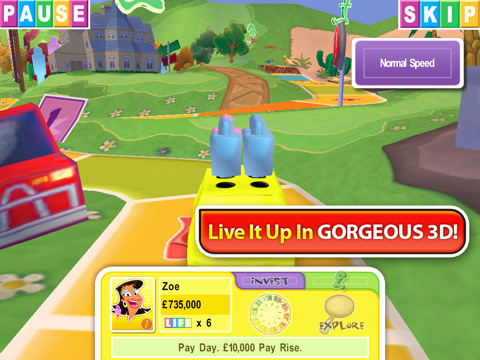 So here we are again, several years later and this time, The Game of Life has made a virtual comeback, thanks to EA Games and the iPad. Just like Monopoly or Scrabble, EA have transcribed the game perfectly on the iPad which recreates this board exceptionally well. With exceptional graphics that mimic the board game, this game can be played solo (which isn't that fun) or with friends (up to 6 via pass and play) which definitely brings back some good memories. The only issue with these board games converted to the iPad by EA is that the title cannot be played online which is a shame because if you're hankering for a game, you need to have people physically present or play with the AI. Even with this setback, all the gameplay is fully there. Like the original game that was reminiscent of Monopoly, players must choose a character (there's some great optimization options here) and then graduate from high school. Once graduated, they can then drive down a variety of paths through life with their car to embark on high education or attempt to get some high paying job. As you play, you are given cards that dictate what happens in your life but to some extent, the player does get a choice. Money however, does play an integral role in the game and the player who lives life to the fullest (e.g. material goods), wins the game. It may not be the most realistic game around but it's pure old school and that's why it's so deliciously fun! 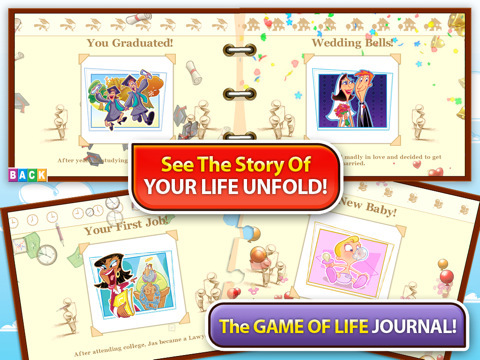 And just like "real life", the players lives will go up and down with the winner receiving a very cool montage of their life at the conclusion of the game. The controls work flawless on the touch screen of the iPad but where the title does shine is through its graphics. It's really run to spin the wheel just like the real board game and watching it slowly come to a halt as you eagerly pray for something good. Graphics are a little cartoony but it suits the genre perfectly as are the sometimes over the top sound effects and humble musical score. The musical score does get a little annoying but that's what configuration settings are for! It's also cool seeing your car drive along the board as well. All in all, the graphics, sound and gameplay come together perfectly. 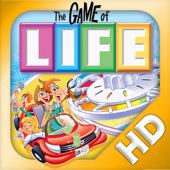 At the end of the day, The Game of Life from EA Games makes the transition from the physical to the virtual perfectly and this is one title that should be taken away with the whole family during vacations. Recommended!